Condition: F-VF. Item ID: kka_5255. You are looking at a DR FFC. Available to USA residents only. I will combine S&H on multiple lots. 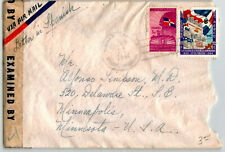 Dominican Republic To Jamaica 1908 With Letter Port Antonio Arrival. Item ID: bbz_252 Condition: . 1969 Paquebot Cover, R.M.S. Anders, British stamp used in Kingston, Jamaica. Interesting cover, date illegible. Opened roughly at top.